I’ve served several clients who “know” the cards and read for themselves. That’s great. I actually learned to read tarot because I was going through some things almost 20 years ago and had a friend tell me the cards might offer a clearer picture of my situation. Let’s be honest though, emotions color the reading. The closer you are to the situation or client (yourself, friend or family member) the more the reading can be affected by emotion rather than universal truth. Psychics turn to each other to gain a clearer understanding of their personal situations, but it’s important to LISTEN to the person you’ve turned to. The worst thing a tarot card reader can do is look at the cards another has laid out for you, and interpret them in YOUR manner, negating everything the other is telling you. I’ve had to get real with some clients who try walk all over my reading, explaining that I’m reading suits incorrectly, etc… No I’m not interpreting incorrectly. I’m reading the information from the cards in the way I read them. The beauty of the tarot is the fluidity and personal perspective attributed by each individual reader. 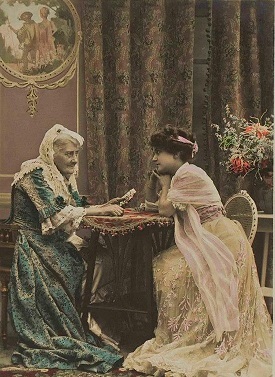 Most professional tarot readers know this, but there are many out there who, for whatever their reasons, think it’s appropriate to tell others how to read their cards. So, in case you didn’t know, telling another card reader, one who is in the business of tarot work, is not only inappropriate, but it negatively affects your ability to listen to the information coming to you. I, for one, find it very exciting and interesting to receive readings from another because they can offer fresh perspective and insight. While it might be easy to look at the layout and begin interpreting, viewing what you want to view, it’s wrong to negate what another is seeing for you through a narrow-mindedness of the meanings. Be open to another’s point of view, and you just might learn something. friendly readers, psychic friends, readers helping readers, using other psychics, working with other tarot readers. Bookmark.